Notes: I want to like zucchini. Really, I do. I made this in the hopes I would come around on zucchini. The bland zucchini overwhelmed the garlic and herbs (and even the lemon and Parmesan cheese I added to try to doctor this up). Rating: Not good. Not good at all. We tried this too, and although I kind of liked it, it elicited the gag reaction from my 15-year-old! Not spewing, mind you, but a peanut butter sandwich was the rememdy. Question: WHY does everyone grow so much squash? Simply because they can?? Grate about a pound of zucchini (drain and strain really, really, really well). Mix with one can of black beans, 12 oz. shredded cheese, a little salt and pepper. Use as a quesadilla filling. 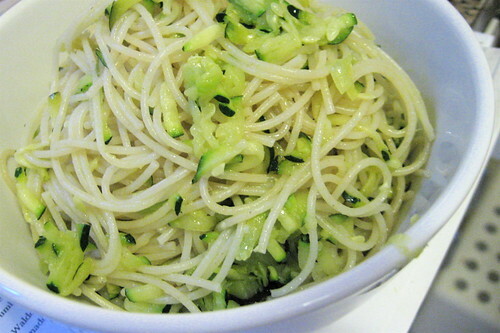 Pingback: #45: zucchini over pasta on Flickr - Photo Sharing!